Using AIM (AOL Instant Messaging) : I was available from 9 pm to 9:30 pm for students to ask questions about their homework. Sometimes they would ask about homework. Once, they had just wanted to tell me that they now have a skateboard sponsor; they just needed someone to care, to share their excitement. Once, they wanted to tell me that some older kids had been beating them up in the locker room while the gym teacher looked away. Using Facebook: Some students are my “friends”, some are not. Contacting students about scholarships: cell phone numbers and addresses get turned off/on, change with income, especially for a transient student population. We had been granted money to run a summer science program for urban teen girls, and this was the only way I could reach most of them. Conducting informative polls: When writing grants, my Facebook connections were invaluable when designing a student-centered curricula that the students were actually excited about! Brainstorming: Through FB chat, I asked students to help choose a name for our program, a name that was appealing to THEM, not US. They came up with Scinamic Health. 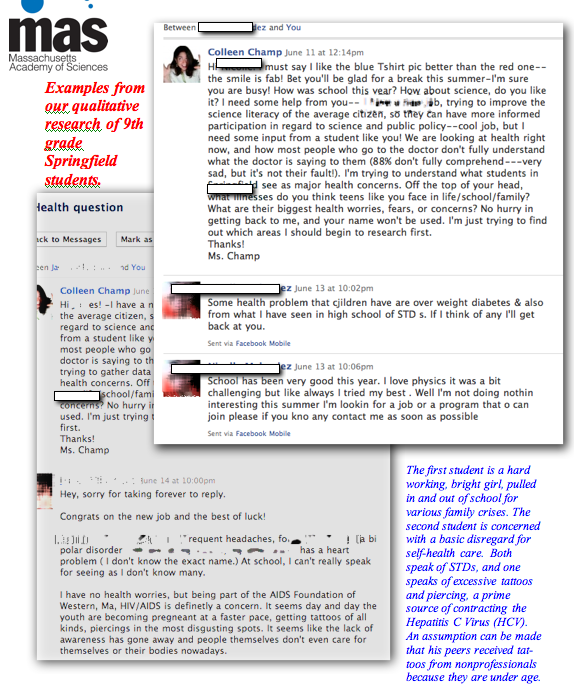 Community: Girls in the summer science program stay connected with teachers/mentors/college professors through a FaceBook Group. Virginia has drafted a plan to stop teachers from using social media to communicate with students. I’m sure many states are in the process of doing the same. Granted, some of my interactions with students have been after they had left my class, but contact with them has been extremely valuable in developing informed designs, because the programs are designed using their input. Managing my groups in Facebook keeps them out of my personal life, and me out of theirs. As with any adult-child communication, be it face-to-face, by phone, or online, extreme care must exercised to protect students. But, of all the venues, social media leaves a permanent digital footprint (let’s call it a digital fossil) that can be tracked. If anything, online communication is safer than face-to-face, and it would be a shame to close it down. P.S., Because of Facebook, I found a summer science program for one of the students above who said she had nothing to do over the summer. She was also instrumental in helping me get more girls to join the program as well. Previous Bad at Math? Blame your Parents! I mean I get it, things could easily get weird with student-teacher relations on most social networking sites, and administration doesn’t want to deal with the liability. But I think legislation against such behavior is problematic– what does “social network” even mean? Does this blog count? Does a discussion forum count? Email? What about Moodle, Ning, or WordPress communities designed specifically for class? How would anyone monitor the social networking communication, and what would the consequences be if it was broken? What about the nature of the interaction? How are students supposed to learn what is appropriate online behavior and what isn’t? Etc. I think something like this just further alienates teachers and makes them an inauthentic “other” that they shouldn’t talk to unless it’s a question about their grade, which is the exact opposite of how they should be perceived. Hi Jason, I completely agree. Students have a rich vocabulary, a rich cant that teachers are excluded from if they are not part of the digital culture. They’re marginalized from communities of practice. At the center of the community, at the heart, beat all the different forms of communication you mentioned, and those who know it well have centripetal pull within the community. The digital patois is the new acrolect, and teachers become clueless bumblers!